All individuals are hermaphroditic and livebearers, a single snail can turn into many. A scavenging snail, will constantly hunt for food and can be supplemented with blanched vegetables and algae wafers. Most active at dusk, or just after lights out. Likes to burrow so a sand substrate is preferred. Generally doesn't eat aquarium plants. 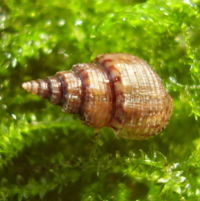 Different from the more common Melanoides tuberculata in that it's shell is shorter and stockier, usually coloured a rich red-brown. This page was last edited on 14 November 2014, at 11:23.